Details matter when it comes to trade show exhibit design. That’s why the mackenzie EXHIBIT team carefully designs and builds each design element. 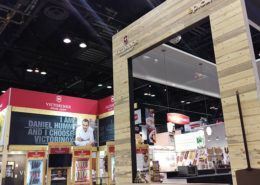 The end result is a booth that leaves a lasting impression of brand values on attendees. mackenzie EXHIBIT is a full service management company with capabilities in the USA, Canada and Europe. 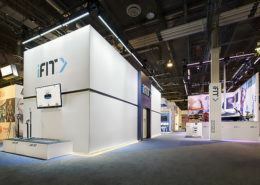 We provide complete trade show services including affordable display storage, refurbishing, shipping, installation, dismantle and on-site supervision. 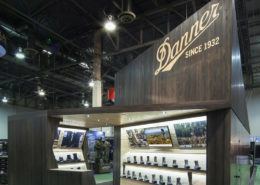 Custom rental exhibits are a cost-effective alternative to owning a booth. 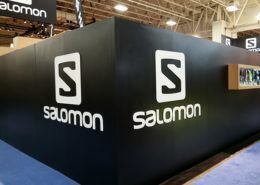 We design custom booth rentals for small displays up to large island exhibits. Combined with bold graphics, you get a custom trade show exhibit design that will make a big impact. Our skilled craftsmen will take your retail store or showroom design to the next level by constructing a space that showcases the important characteristics of your brand. The possibilities of what our state-of-the-art shop can build to satisfy your needs are limitless. Each project combines functional design, compelling graphics and master craftsmanship to ensure maximum impact. Take a look to see what we mean. 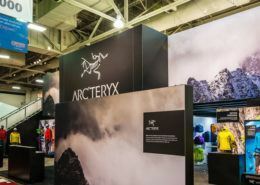 Arc’teryx has partnered with mackenzie EXHIBIT for over 12 years, relying on them to design, construct and manage our international trade show exhibit infrastructure. We rely on them to expertly oversee our tradeshow organization, and the results have been exceptional. mackenzie EXHIBIT is an integral and valuable part of our business. I have worked with mackenzie EXHIBIT for the past three years. They are very professional and will do whatever it takes to make you happy. They know the business very well and will make it a simple process for you. I would highly recommend them for any trade show; they will give their all and you will be happy with the outcome. We have been working with mackenzie EXHIBIT for more than 12 years (since 1999). During this time we have used mackenzie EXHIBIT for a variety of services including International (Canada and Germany) trade show booth design and installations, U.S. trade show booth design and installations, “Shop in Shop” installations, flagship store development including custom fixtures, POS displays, lighting strategies, project/construction management, and 3PL services for distribution needs in Canada. Our experience with mackenzie EXHIBIT has been exceptional. The service level has been outstanding, their attention to detail is excellent, and they have a very strong commitment to staying on project/trade show set-up timelines. In addition, the pricing has been very fair, they have offered many creative solutions for product displays that have saved us money, and probably the most important aspect, they are a very enjoyable group to work with from the top of the organization to the bottom. We are looking forward to our continued relationship with mackenzie EXHIBIT and an expansion of their services offered. The team at mackenzie EXHIBIT is talented, hardworking, enthusiastic and a pleasure to work with. 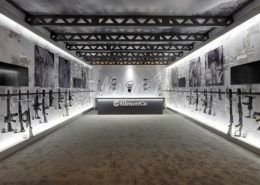 I’ve had the opportunity to work with mackenzie EXHIBIT in trade show settings in the United States, Canada and Europe. They have always delivered on time, within budget and most importantly, work with a positive attitude during stressful timelines. They are also very resourceful and creative when unforeseen circumstances arise. If you are looking for a professional yet personable exhibition company to work with, mackenzie EXHIBIT is outstanding. Thinking about getting started? Contact our team to tell us about your project. 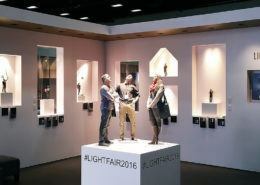 Have a question about your exhibit? Let us know what we can for you. Check out what we’ve done for other companies and how we’ve helped. mackenzie EXHIBIT has offices in Ogden, Utah and the metro Vancouver, British Columbia area. 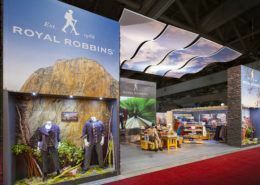 We provide custom trade show exhibit design services throughout the United States, Canada and Europe.